Enjoy the flow of Ayung River in Bali with transfers and a buffet lunch. Take a morning or noon trek to the scenic Ayung River for an unforgettable white water rafting experience. The river is class II and may rise to class IV during rainy season. Expert and experienced guides will give you an insight into the river ecology and amaze you with their dexterity and skills in this classic adventure tour. Choose morning or noon departure! Be picked up at your accommodation's lobby and head to the river rafting location near Ubud artisan village. 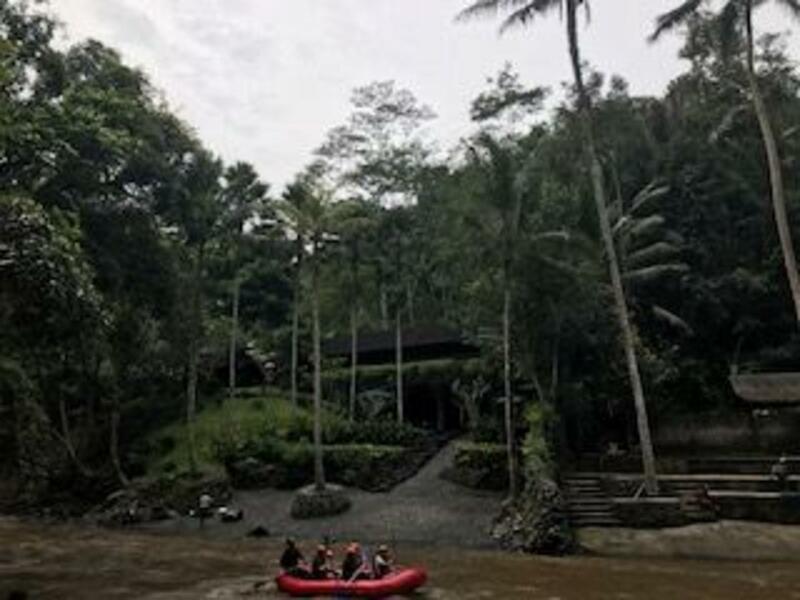 Upon arrival at the river rafting place, enjoy a refreshing welcome drink, get instructions from the guide, be briefed on the itinerary and have a safety talk about your upcoming rafting adventure. Then, get your life jacket and equipment to get ready for some rafting. Please be ready to walk around 400 stairs down for exercise to get into the starting point of the river raft. Begin your river rafting adventure and discover hidden waterfalls, swim in the pristine waters and feel the thrills of the river. During two hours of rafting, you will experience an unrivaled way to appreciate the natural scenery, wildlife, and exotic plants of Bali. After around two hours at the river, please be ready to climb up another 400 stairs up at finish point. Refresh your body and change out of your wet clothes. A buffet Lunch will be served at a restaurant as you bask in the energy of one of Bali’s most tranquil settings. You will be transferred to your accommodation, this will last around 6 hours from pickup till drop off. Everyone got a story to tell, and different experiences that have been faced. Not only from our point of view, these travellers review about Bali White Water Rafting Adventure attraction is here to help us earn your trust. First time, we have done water rafting, great day. Hotel collection was included and on time, only 4 adults on this 3/4 day tour. Can feel tiring traveling over 2 hours to reach location. Great staff, booked with sister company Viator with discount. Double price with company direct?? Included transfers, buffet meal and soft drink, wow how can they do it for that price. Recomended for all ages, Good fun. Brilliant we absolutely loved it. Fantastic value. Very friendly and helpful staff. We will be back for sure!!! Amazing experience, first rate instructor and nothing can prepare you for the amazing scenery you will see, rafting itself is not too challenging so great as an introduction, only problem you will have is finding another location to top this one. As with all our experiences in Bali the hotel pickup and transfer was seamless. Food at the end and beers on route. We had so much fan on this trip. The river is perfect for rafting, not too difficult. The scenery is amazing. Definitely recommend it. Our driver was amazing, so friendly took time to point out things on the drive to rafting. Our rafting guide was awesome and through no fault of his but the idiots we were sharing the raft with we tipped. A scary experience but the guide did everything possible to ensure everyone got through it safely. Except for that it was the usual enjoyment of rafting where you enjoy the beauty of nature. The shower facilities werent great but still useable. Lunch was enjoyable and ample amount of food was provided. Great fun. The walk down to the river and back up at the end may make some people struggle as it is very steep with lots of steps so it's not for everyone. I had a fantastic time. This was awesome, the white river rafting tour was excellent with fun and experienced guides. All four of us enjoyed the ride. Tis company from our perspective appeared to have better guides with only four in a raft which proved to be a better experience. No hesitation from us in recommending this tour with a good food buffet to finish off the day. We had the best time out rafting on this trip. It was organised very well from picking us up from the hotel to dropping us back. Food served was quite okay too. Highlight was the rafting bit and there was so many photo opportunities and it was a nice experience. This tour was great value for money - it was almost half the price of local white water rafting tours we enquired about in Seminyak. The tour guides were very friendly and energetic, and the views along the Ayung River were absolutely breathtaking. Easy river for beginners, but still a lot of fun, and amazing scenery. The guide was really nice, and everything was well organized. The lunch was just ok, but for the price, it was a great value. Since we were pick up from the Hotel, everything went excellent. The private driver was very friendly and our guide Jack 92 made this experience memorable as he has great sense of humour. The views are awesome and after 2 hours having fun along the river, you can get changed or have a shower you do not need a towel or soap, but bring dry clothes and flip flops. The buffet lunch was very good. Extremely good value with everything included! If you can get over the trip down to the river 400 steps down and 200 steps up!! you will have a fantastic time. Our guide was Newman and made our rafting trip memorable. If you've thought about white water rafting but were a bit scared to do it, this is the one for you! Lunch was also good, fresh and tasty. Excellent time was had by myself and my 2 sisters. This is a beginner friendly set of rapids that is a hell of a lot of fun, you get to see a huge amount of scenery and you just have a bloody good time! The guide was great. It was great fun. The views are stunning and the guide, Alex, was amazing. The rafting is easy, the river is not dangerous at all, so it's good for beginners but the walk to and from the river is challenging. The buffet was good and fresh and they offer towel and soap for shower. Bring dry clothes! It was definitely worth it. A few days before the departure, the rafting tour I booked got cancelled due to the weather and the effect of the volcano eruption. So, we were worried. We changed the routing tour to this one with the same company, and the weather was nice.... Anyway, I would like to make some suggestions for participants. You will get wet. I repeat. You will get wet. So, make sure to bring the change of clothes. Due to steps and steep hills, we were wearing sneakers. Although we dried them in the hotel, it smelled bad. So, different types of water proof shoes are better. Everyone was friendly. The pumpkin soap at lunch was good. We were not sure how much we were supposed to tip the local staff with boat. Great tour, wonderful guide. The only thing I'd say is it isn't the most exhilarating- the rapids weren't quite as exiting as I expected. However, beautiful views and wonderful experience. Well worth it! Very beautiful place and tour company was professional. Our guide was funny and had a really good time. Good experience although not that challenging with the small rapids. Please be mindful though to walk up and down the many stairs to get to raft site is quite physical for most. Buffet that was included was ok not a great selection of food but free so can't complain. Worth a try! My daughter and my 9 year old granddaughter had great fun on this white river rafting on the Ayung river. Extremely good value with everything included, even a tasty lunch. The skill level was perfect for beginners. Lots of fun and thrills with top notch instructors. The only downside that people should be aware of is that the climb down to the river is long and very steep with many of the tour party struggling to keep up. The climb back up at the end of the tour is also quite challenging.